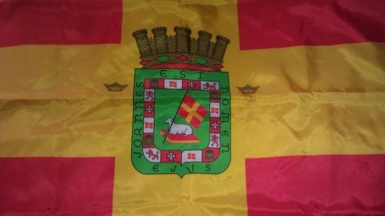 On 25 April 2006, representatives of the Spanish government delivered in San Juan the "Bandera de Fortificación" to the "Regimento Fijo". 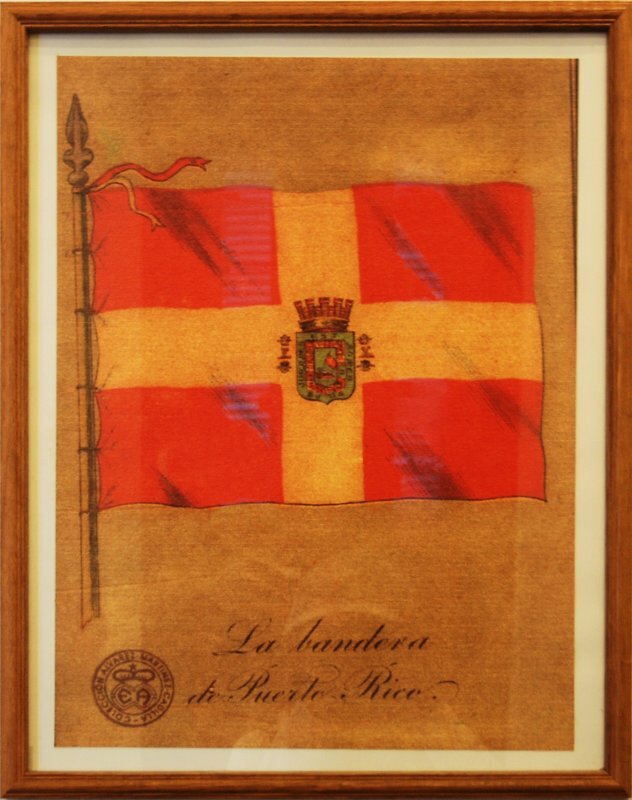 This flag was the first to bear the shield of arms of Puerto Rico. The shield was granted by King Charles IV of Spain to the first Spanish regiment to incorporate local soldiers, that contributed in 1797 to the expelling from San Juan of the English troops (68 vessels and 3,000 men) commanded by General John Abercrombie. The "Regimento Fijo", which is involved in the commemoration of historical acts, required the return of the flag at the Spanish Embassy in Washington, which contacted the Spanish Army. During a very short period of time, from 1873 to 1875, a Republic was proclaimed in Spain, after the dethronement of Isabella II (1833-1868) and the following abdication of Amadeus, Duke of Aosta, as King (1870-1873). The change from Kingdom to Republic was apparently felt, at least vexillologically, in Puerto Rico with the incorporation of a new Coat of Arms and flag. Both images can be seen in the small museum at Arecibo's Museo del Faro (Lighthouse Museum). Nobody is sure how long they were used, if ever. Source: photos taken by Nelson Román. This is the Puerto Rican flag photo under Spanish rule1873 to 1898. This is a replica. I suspect that the original flag was with WHITE CROSS (also in the arms) but was of yellow apparence after many years, and by association of Spanish colours born this R-Y flag. No. 848 - Portorico [This is the matricule province flag for Puerto Rico]. Francisco A. Scarano in "Puerto Rico Cinco Siglos de Historia" a generally recognized textbook, on p. 432 has a B&W photo of a man and woman holding the flag. They are not identified, but on p. 442 there is a photo of a woman (older) who is almost certainly the same and she is identified as Mariana Braccetti with the mention "Bordó la bandera de Lares." That is, "She embroidered the flag of Lares." "Its faded, and has a few stains, but the battle flag in Westfield is in good condition. Considering it dates back to the Spanish-American War of 1899. "The flag had a label on it that said captured at the battle of San Juan Hill," said Dr. Robert Brown, a local historian. The flag was found at the Westfield Athenaeum. In an attic, folded up in a box. "It appears to have belonged to the equivalent of a national guard unit that may have very well fought in the Spanish-American war," explained Dr. Brown. Local Historian, Dr. Robert Brown is chair of an historical task force, who has spent the last few years looking at items people have donated over the century. They've determined it's the oldest Puerto Rican national flag in existence, and pre-dates Puerto Rico becoming a U.S. territory. The flag will be given to the National Puerto Rican Cultural Historical Museum in San Juan during an official ceremony in November. 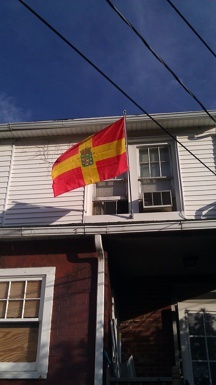 Until then, the flag is on display at the Athenaeum on Elm Street." As shown on a colour photography, the flag is vertically divided red- yellow-red, c. 1:2:1, with an emblem in the middle, surrounded by the black lettering "BATALLON PROVISIONAL" (top) / "PUERTO RICO No 3" (bottom). There is also a video capture of the scene on the same page. Part of Dr Brown's explanations on the TV channel have been deleted from the written version I have quoted. Brown says that the flag is most probably authentic because it was found together with other authentic items of the same period. 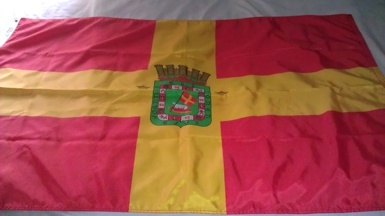 If this is basically the Spanish flag with the battallion crest in the middle, wouldn't one expect it to have been flown with the red and yellow bars horizontal? In this case, the battallion crest would have appeared on its side, which seems to be unlikely. It would appear, therefore, that this "flag" was designed to be hung vertically and is, therefore, not an item which would have been carried or flown in action. 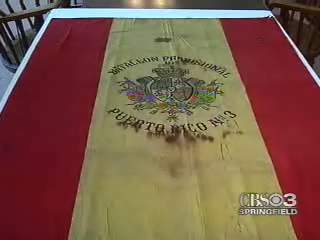 I would also quibble with the description of this item as "...the oldest Puerto Rican national flag in existence". This "flag" is clearly that of a military detachment and, as such, cannot be said to have any "national" characteristics other than those of Spain. In the Dictionary of Modern Romanian Language isssued by the Romanian Academy in 1958 there are several (wrong) flags, including one for Puerto Rico.